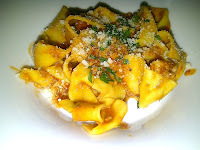 Our 2nd Winterlicious adventure this year was at Noce, a fine Italian restaurant on Queen West. It was packed when we arrived last Saturday, filled with what looked more like regulars than just the Winterlicious crowd. Looks like Noce is an old favourite! We were warmly greeted by staff at the front and seated in one of the intimate dining rooms. dishes as possible, we both had the pappardelle with lamb ragout to start (the salad was not enticing and I'm not a fan of bean soup). Our food came quickly and well prepared, but the pappardelle was just warm and not quite hot enough. My personal preference is also for fresh pappardelle vs egg noodles but it was still tasty and we finished it quickly. For mains, I had a perfectly seared trout on broccolini. This dish was an indication of the fine dining establishment Noce is, the fish was well prepared and the skin seared crispy and tasty. 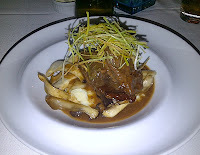 Tony had the braised veal cheeks, with mushrooms and leeks on mashed, a homey, saucy dish. Finally for dessert, we had gelato and a very frothy tiramisu that I could never finish on my own. We had a nice meal at Noce but did not find it extraordinary or an exceptional value ($45 dinner menu - but perhaps a good deal vs regular menu prices). I appreciate that Noce did not skimp on the details for their Winterlicious menu and I have no doubt the restaurant has excellent standards and can live up to it's fine dining reputation for Italian lovers out there. This is the kind of restaurant to take your parents/in-laws to, solid performance. WINTERLICIOUS: A Great Meal at Chiado!